This project is a combination of digital an handmade artwork and it was commissioned to me by Stavros Tachos, a new coming musician- composer, who’s music is oriented towards theater, cinema and animation. It consists of a logo and handmade illustrations. 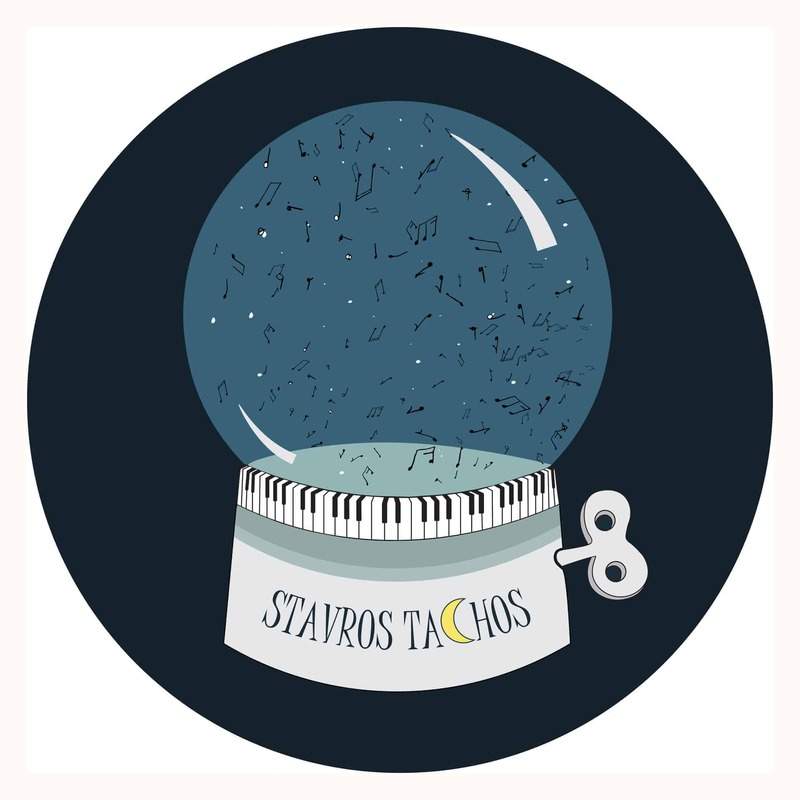 Stavros wanted a logo that would combine storytelling with music, so I designed a music box that has trapped a music sky inside it. The illustrations I present have characters that would suit to a children fairy tale. They are children with their pets standing in the foreground while music appears popping up and surprise them, through music notes falling down, stream through their hair or coming from the sound of traveling gooses in the night sky. After I’ve listened to his music, I followed the feeling the music tracks put across. His style is lyrical and has an ethereal sense. So I decided to go with the softness and fragility of watercolors. I used mainly shades of blue, that bring us a sky effect. The music track brought me bittersweet feelings, so I drew the innocence (children with happy colors) combined with a winter feeling background. The logo is a magic ball/ a music box, that includes a windy sky full of music. Blue color was used here too. It was created digitally. For the logo and the animation I used adobe illustrator and Photoshop after I had sketched the basic Idea on paper. After we agreed with Stavros on the logo, I started illustrating on aquarella paper the worlds that could welcome his music. I used Watercolors, watercolor markers and color pencils. The final result was scanned and slightly edited in Photoshop. I was really pleased that my work was given prominence by a beautiful music project and found the appreciation of many people. Through the project I ascertained once again how I love to cooperate with creatives from different fields and give together the best out of it. Through this work I also found out a slightly new style for my illustrations that was embraced by a wider audience.